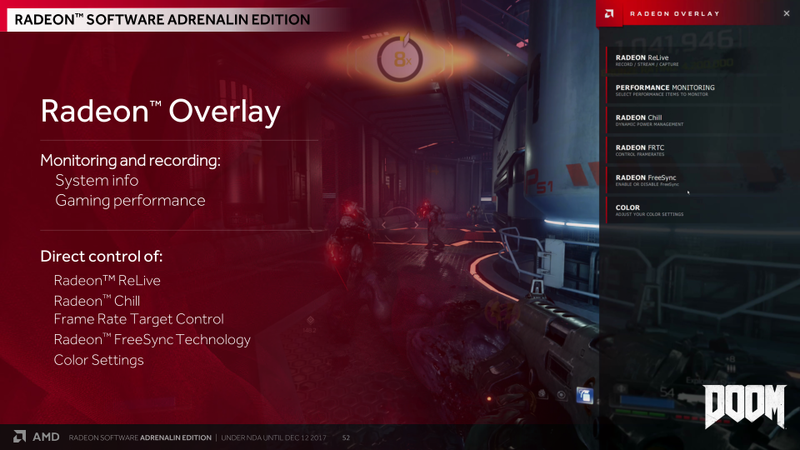 As one of the main features of Adrenalin, Radeon Overlay is a little difficult to sum up neatly. 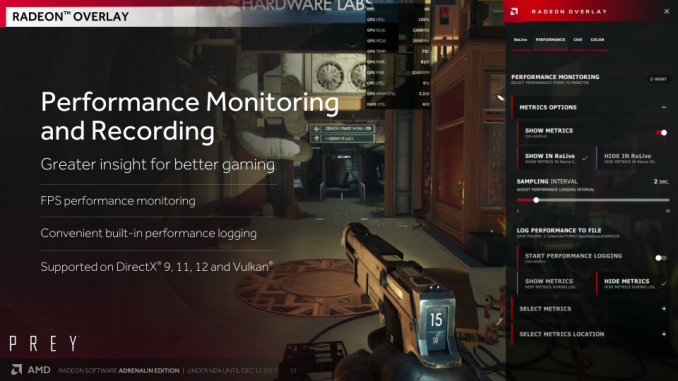 It’s essentially an in-game/desktop overlay of certain Radeon Settings options and tools, combined with OSD and performance logging/monitoring functionality. 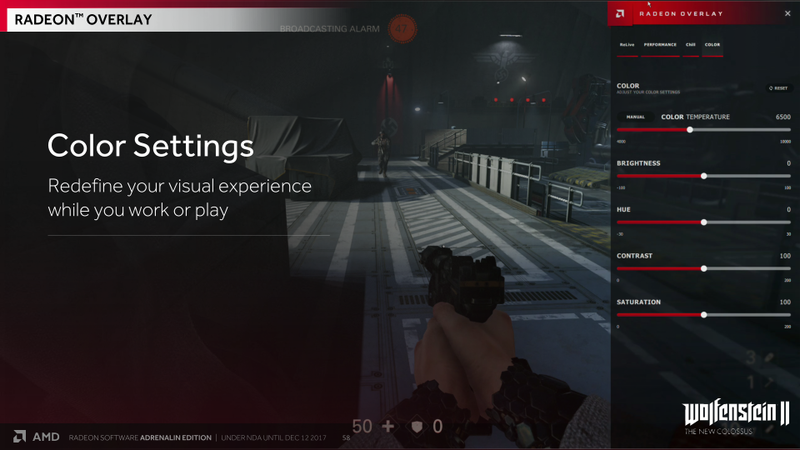 While an overlay, AMD noted that the overhead was very small and that Radeon Overlay would not interfere with Steam in-game overlay and others. Radeon Overlay hooks into particular hardware in GPUs, and while AMD mentioned that it supports a wide range of products, a full compatibility list was not disclosed. By default, Radeon Overlay is enabled by ALT+R. While Radeon Overlay works in windowed, borderless fullscreen, and exclusive fullscreen mode, performance monitoring only works in fullscreen for DX9, 11, 12, and Vulkan applications. The monitoring and logging is confined to Radeon Overlay and separate from the WattMan monitoring, which has no logging capability. The performance monitor OSD can be anchored to different parts of the screen. The list of performance monitoring metrics is as follows: FPS, GPU Utilization, GPU Engine Clock, GPU Memory Clock, GPU Temperature, GPU Power, GPU Fan Speed, CPU Utilization, System RAM Utilization. 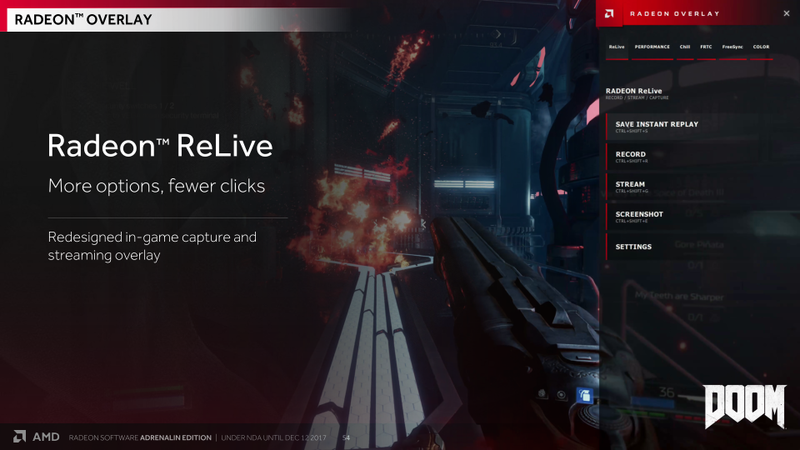 Unsurprisingly, ReLive is a large aspect of Radeon Overlay, which replaces the older ReLive toolbar. OSD metrics can be hidden from ReLive capture as needed. With the record/stream region, a specific window or application can be captured while in windowed or borderless fullscreen mode. AMD mentioned that enabling FRTC or Chill (both exclusive fullscreen only) will require a restart, but adjusting them once enabled will not. Provided that it is already enabled on the monitor, FreeSync can be enabled in-game. Like the rest of the options, Color Settings will apply instantly, and can be applied per display for multi-monitor configurations.